We always knew Facebook was big, but until the social network filed papers to become a publicly traded company, we didn't know exactly how big. 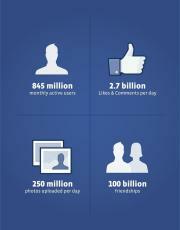 Facebook is very close to hitting the one-billion-users mark, and as predicted, that will probably happen in 2012. The company also turned a tidy profit to the tune of $1 billion in 2011. More than half of Facebook's monthly active users visit the social network from mobile devices, and about 80 percent of Facebook's fans are outside the U.S. and Canada. The company hopes to raise about $5 billion during its initial public offering, which has yet to be scheduled. Facebook founder Mark Zuckerberg will serve as the company's chairman and chief executive and will be the company's largest and controlling stockholder. Facebook said it had 845 million active users as of Dec. 31, with slightly more than half of those people, 425 million, using mobile devices such as smartphones and tablets to visit Facebook. An average day on Facebook sees about 483 million people logging into the world's largest social network, an increase of 48 percent over the previous year. Thanks to the presence of the Facebook "like" button on almost every website known to humanity, the social network adds another 2.7 billion likes and comments every single day. Users also upload 250 million photos to Facebook every 24 hours, and the social network has helped its users create 100 billion online friendships. Facebook has been busy making money in recent years, as well as growing fast. In 2009, the company said it brought in $777 million in revenue. That figure grew to $1.974 billion in 2010, and then almost doubled in 2011 when the company had $3.71 billion in revenue and $1 billion in profit. The S-1 filing also shows that digital cows, crops, and mafia hit jobs are a big source of revenue for the company; social game maker Zynga was responsible for about 12 percent of Facebook's revenue in 2011. Facebook isn't sure it can move into China and is concerned about any restrictions the Chinese government might put on the company. This is a lesson Facebook likely learned from Google's problems with Chinese authorities in early 2010 that resulted in the search giant shutting down its ".cn" Chinese-language search engine. "We continue to evaluate entering China. However, this market has substantial legal and regulatory complexities that have prevented our entry into China to date," Facebook said in its SEC filing. Later in the document the company added, "We do not know if we will be able to find an approach to managing content and information that will be acceptable to us and to the Chinese government." Not only will Zuckerberg serve as chairman and CEO, he will also be granted the power to name his successor if he still controls the company when he dies. "In the event that Mr. Zuckerberg controls our company at the time of his death," Facebook's S-1 filing says. "Control may be transferred to a person or entity that he designates as his successor." This clause has struck some analysts as unusual, according to several reports including The New York Post and Bloomberg Businessweek, but the clause also makes it clear that Zuckerberg is Facebook's ruling power.